Some married couples would be alarmed by the notion of working in the same profession and for the same company. 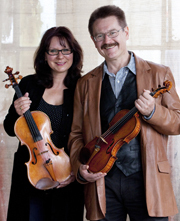 Long-serving Australian Opera and Ballet Orchestra (AOBO) members Marek Kruszynski (violin) and Magda Kruszynska (viola) are not among them. “We’ve always worked together; it would be hard to imagine what it would be like not to,” Marek says. The warmth and goodwill between the artists is obvious, and makes chatting to them a pleasant experience. When discussing their life together, they constantly refer to each other for confirmation, and gently touch each other’s hands to emphasise a point or check a fact. They laugh heartily and frequently, and often talk at the same time, so that it can be difficult to decipher what either one is saying. Both grew up with music. Magda’s parents are professional musicians – her mother a pianist and her father a musicologist and composer. In their home, Sunday afternoons were considered holy, though not for religious reasons: “On Sunday afternoons the Berlin Philharmonic conducted by Maestro von Karajan was on TV, and the whole family would be expected to sit around the dinner table and listen in absolute silence,” she says, smiling at the memory. Marek’s parents were academics, but his father played the violin until shrapnel wound to his right hand, acquired during the War, put a stop to it. Coming from such musical families, it was natural for both musicians to pursue careers in music too. They hoped that their son, Michael, would be a musician too, but they let him be when at age 17, having passed his final violin exam with high distinction, he told them that a career in music was not for him. Marek says: “I think he was discouraged by all the late nights that our music careers had involved.” As immigrants with no family in Australia, they relied heavily on babysitters when Michael was growing up. The Kruszynskis came to Australia in their mid-20s, in search of the seemingly contradictory ideals of adventure and a more stable life. 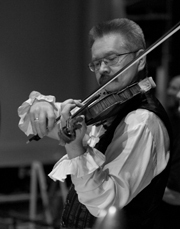 Until then they’d both been members of the touring Baltic State Philharmonic Orchestra, Marek as concertmaster. Besides through Magda’s father’s trip, they knew Australia through the movies. Marek says: “In the Poland in which I grew up, the Australian Outback was a mythical place captured in many films.” Which ones? They laugh. They can’t remember now. But they think there was one with Sigrid Thornton. When they left Europe, the Kruszynskis had no idea what they would do in Australia. They’d contacted no music organisations, thinking that they might teach, or do something completely different. “We were young and full of energy and ideas,” Marek recalls. But he quickly found contract work with the Sydney Symphony. Two years later, when Magda found work with the then Australian Opera, it became very difficult to co-ordinate their respective rehearsal and performance times with the needs of a young child. “We hardly saw each other,” Magda says, shaking her head. 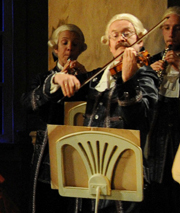 When three months into her new career there was an opening in the Orchestra’s violin section, and Marek auditioned and got it. The first opera he played was Turandot. “I had goose bumps; I was in awe,” he says, stroking his arms at the memory. At the 17th and last performance, he still had goose bumps. Magda’s father never revisited Australia to take more pictures of Uluru, but her mother has been for a visit (“I treasured the time with her”) and both Kruszynskis have been back to Poland numerous times.